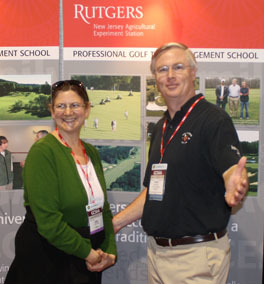 Dr. William Meyer with his wife Jane in front of the Rutgers Turf Management School Booth. Rutgers Turf Senior Program Coordinator Fran Koppell (front, red shirt) and Two Year Turf Management Instructor and Plant Diagnostic Clinic Principal Laboratory Technician,Sabrina Tirpak (rear, black shirt) with students in front of the Rutgers Turf Management School Booth. Camarillo Springs Golf Course (California) Superintendent and 2004 Rutgers Turf Management School Graduate Daniel Warne standing in front of the Rutgers Turf School Booth. Camarillo Springs Golf Course (California) Superintendent Daniel Warne at the RU Turf School booth. 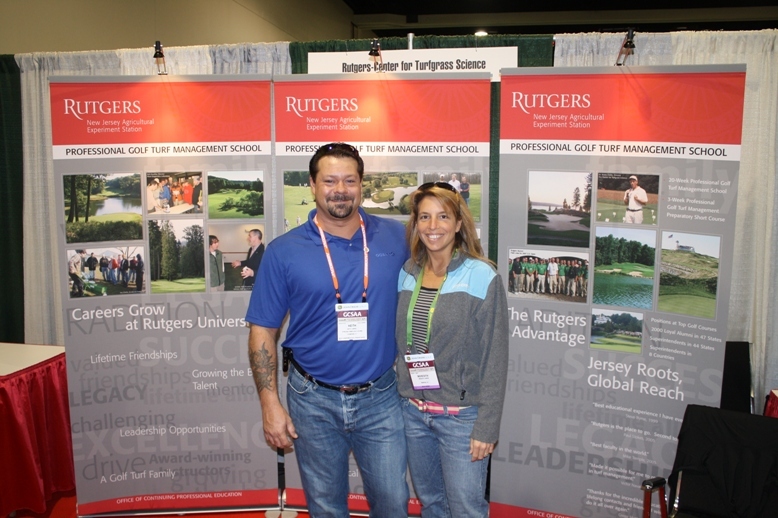 Oro Valley Country Club (Arizona) Golf Course Superintendent and 2004 Rutgers Turf Management School Graduate Darrin Baker with his wife in front of the booth at the 2010 GCSAA Conference.